Sarah Nader- snader@shawmedia.com McHenry County College students Anna Gallagher (left), 20, of Union, Laurissa Mortensen, 18, of Genoa City Wis., Ashley Niemesz, 20, of Harvard and Leanne Johns, 20, of McHenry help paint a graffiti inspired mural that was started by Chicago artist Nino Rodriguez at MCC in Crystal Lake Thursday, February 13, 2014. The event showcased art and photos along with discussions about the popular worldwide phenomenon know as graffiti art. Students and staff had the opportunity to help complete the graffiti mural in the commons area. Sarah Nader- snader@shawmedia.com In-between classes McHenry County College student Laurissa Mortensen, 18, of Genoa City Wis., helps paint a graffiti inspired mural that was started by Chicago artist Nino Rodriguez at MCC in Crystal Lake Thursday, February 13, 2014. The event showcased art and photos along with discussions about the popular worldwide phenomenon know as graffiti art. Students and staff had the opportunity to help complete the graffiti mural in the commons area. Sarah Nader- snader@shawmedia.com Leanne Johns, 20, of McHenry helps paint graffiti inspired mural that was started by Chicago artist Nino Rodriguez at MCC in Crystal Lake Thursday, February 13, 2014. Sarah Nader- snader@shawmedia.com In-between classes McHenry County College student Laurissa Mortensen (left), 18, of Genoa City Wis., helps paint a graffiti inspired mural with Chicago artist Nino Rodriguez in Crystal Lake Thursday, February 13, 2014. 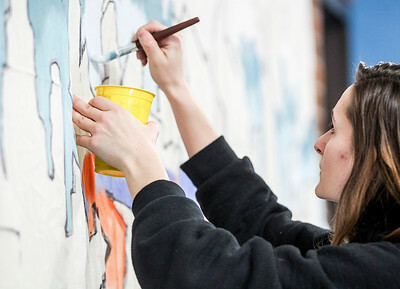 In-between classes McHenry County College student Laurissa Mortensen, 18, of Genoa City Wis., helps paint a graffiti inspired mural that was started by Chicago artist Nino Rodriguez at MCC in Crystal Lake Thursday, February 13, 2014. 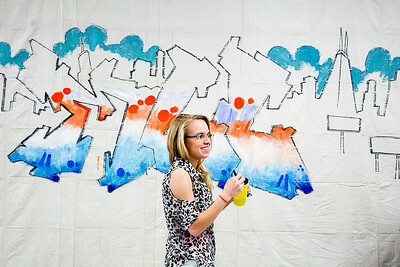 The event showcased art and photos along with discussions about the popular worldwide phenomenon know as graffiti art. 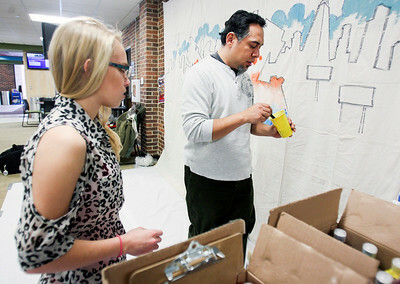 Students and staff had the opportunity to help complete the graffiti mural in the commons area.